The Assumption of the Virgin Mary into Heaven, informally known as The Assumption, was the Virgin Mary ascending into Heaven at the end of her earthly life. The Assumption is Mary’s heavenly birthday. Her acceptance into the glory of Heaven is seen as the symbol of the promise made by Jesus to all Catholics that they too will be received into paradise. Mexicans make a clear distinction between how Mary is raised into heaven by the Father, Son and Holy Spirit while Jesus ascended of his own accord. 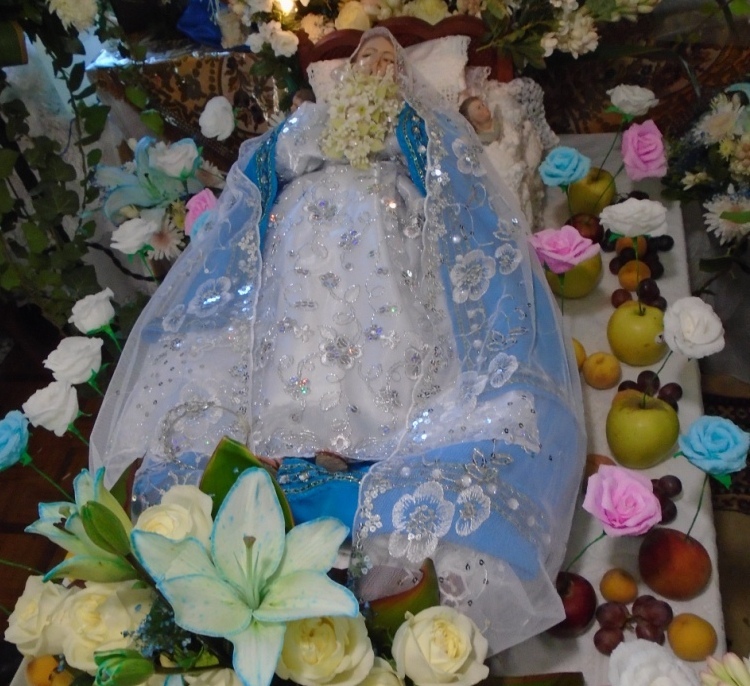 In San Miguel, Mary’s trip to heaven is honored in many local homes and churches. At home, a statue of Mary is laid to rest on a table, as though sleeping, on the 13th. She is surrounded by apples as they were a local fruit in the colonial era (and women often wear apple earrings at this time). Also, Mary is frequently seen standing on a snake with an apple in his mouth, an illusion to the devil and Eve, the first woman. 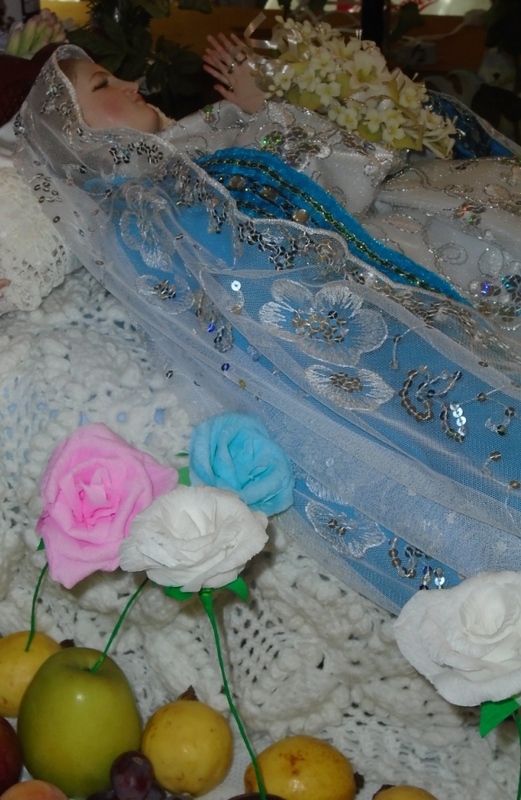 Each apple has a paper flower in the color of angels (blue, pink and white). The faithful surround this image and recite the rosary with song then receive a written blessing from Mary. This colonial era image of Mary is oddly unique. She has removable faces and hands to represent three distinct images of Mary. One is Mary resting prior to her Assumption. The second image has open eyes and hands as the statue of Mary is lifted into heaven on the 15th at home, and in several local churches. The third image is a sad Mary used during Easter to represent Mary’s pain at losing Jesus. The mechanics and artistry of these ancient statues is astonishing. Churches throughout town have services almost continuously with many featuring music, dance and amusements for children.